Indicated for multiple health problems (AMD, colds, respiratory infections, hypertension, sunburn, skin aging). Our dietary supplement has been developed from an exclusive form of vitamin C called Ester C®. Patented in 1989, this form is uniquely comprised of natural, non-acidic vitamin C metabolites, a specific composition that gives it excellent bioavailability. Analysis of Ester C® has shown it provides four times as much vitamin C as other forms – a significant attribute given that vitamin C is recognised as essential for good health. promote the absorption of plant-source iron. Like all vitamins, vitamin C must be provided by the diet. While the majority of mammals are able to produce vitamin C themselves, humans lost this ability a long time ago, and must therefore obtain it in other ways. Fruit and vegetables contain vitamin C, the richest sources including guava, peppers, blackcurrants and citrus fruit, but the preparation of these foods tends to impair their nutritional quality. Being fragile, vitamin C is easily destroyed, particularly by light and heat. Neither can it be stored by the bodywhich is why our daily requirements for vitamin C are relatively high. Nutritional supplementation may thus help ensure an optimal intake, reducing the risk of deficiency and the health-damaging consequences such deficiency can bring. Given its numerous roles, vitamin C has for many years attracted the interest of the scientific community. It is frequently recommended by health professionals for giving the body a boost, particularly in the case of temporary fatigue, times of stress and changes in season which can upset the metabolism. It is thus sometimes referred to as the ‘anti-fatigue vitamin’ or ‘energy vitamin’. Vitamin C’s antioxidant power also gives it significant therapeutic potential. It offers benefits in the prevention and treatment of certain diseases by combatting oxidative stress and free radical damage. Free radicals are involved in the development of many health disorders. Vitamin C may therefore constitute an important asset in treating colds and ‘flu, hypertension, cardiovascular disease, cataracts and certain neurological diseases. In order to produce the best possible vitamin C supplement, our new product has been developed from a specific form known for its excellent bioavailability. 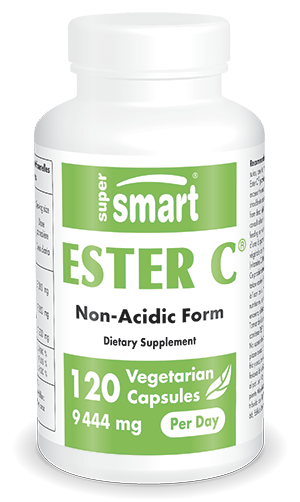 Ester C® also has the advantage of being non-acidic and is therefore well-tolerated by the stomach. There are no reported side-effects from its use. To offer maximum benefit from this patented form of vitamin C, it is encapsulated in vegetarian capsules, each one containing 787mg of Ester C® which provides 600mg of vitamin C. This level of vitamin C means the suggested dose is two to four capsules, one to three times a day, though this dose can be adapted to your needs and the advice of your therapist. Ester C® is a registered trademark of The Ester C Company. Each vegetarian capsule contains 787 mg Ester C® providing 600 mg of ascorbic acid (vitamin C).